INDUSTRY.co.id - Situbondo - The Ministry of Environment and Forestry of the Republic of Indonesia provides awards, plaques and coaching funds to 10 residents / private who care about the environment. 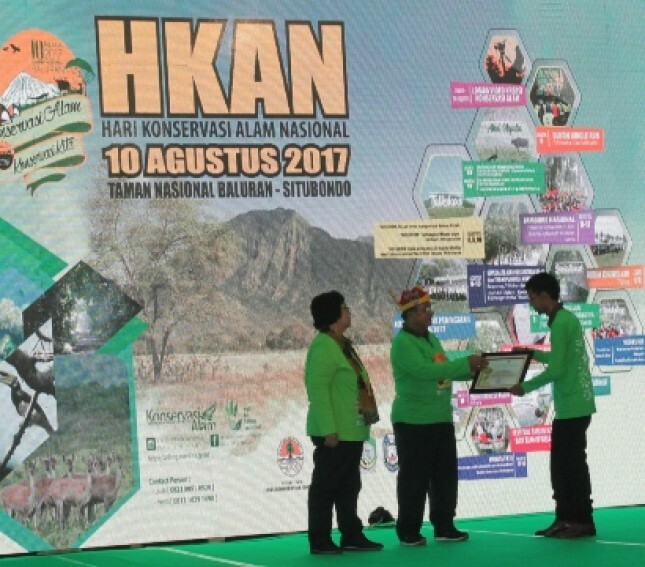 Delivery in connection with National Nature Conservation Day 2017 was held in Baluran Situbondo National Park, East Java. One of the institutions that received the award is Artha Graha Peduli (AGP) Tambling Wildlife Nature Conservation (TWNC) in Lampung. "We are grateful and overjoyed at the award presented by the Minister of Economy Mr. Darmin Nasution, accompanied by Minister of Environment Mrs. Siti Nurbaya," said Ardi Bayu, Nature Conservation Coordinator TWNC who received the award today, Thursday (10/08/2017) in Situbondo. Ardi said the Directorate General of Natural Resources Conservation and Utilization Directorate Ecosystem Conservation Forest Environmental Services stated that PT Adhiniaga Kreasinusa which manages TWNC rated committed to the rehabilitation of the Sumatran tiger and control of invasive species. In the decree, the government assesses the award recipients either individually, companies or communities proven to conduct activities that support the sustainability of the environment and forestry, especially in the field of conservation of natural resources and ecosystems. "This award is given to TWNC as the holder of the best special conservation institution license," said Ardi accompanied Icuk S. Laksito from TWNC. As known, TWNC part of the Bukit Barisan Selatan National Park (TNBBS) formed on the cooperation of various parties, such as Yayasan Artha Graha Peduli (AGP), TNBBS, BKSDA Bengkulu and the Ministry of Environment and Forests (KLHK). Since 2007, TWNC under AGP is assisted by Taman Safari Indonesia, paying full attention to the Sumatran tiger population on the verge of extinction by establishing the Animal Rehabilitation Center (PRS). The establishment of this PRS aims to save and restore a Sumatran tiger that is in conflict with humans. In mid-2008, five Sumatran tigers in conflict with humans were relocated to PRS TWNC and one crocodile was immediately released in Tambling. After rehabilitation, two Sumatran tigers were released on July 22, 2008. While others still need treatment at PRS TWNC. A year later, precisely on October 15, 2009, PRS TWNC was inaugurated as an Institute of Wildlife Conservation by the Minister of Forestry at the time, Zulkifli Hasan. In total, up to this moment has been four times TWNC released into seven male Sumatran tiger and other rare animals such as lemurs, estuarine crocodiles, turtles and eagle. Sumatran tiger reintroduction in TWNC first is performed by the Minister of Forestry MS Kaban on 22 July 2008. Then pelespasliaran second by the Minister of Forestry Zulkifli Hasan on January 22, 2010. Then the third is by Siti Nurbaya KHLK Minister and Minister of NOA Sri Pudjiastuti on March 3, 2015.